Developing better and more accurate methods of diagnosis is an important research focus. 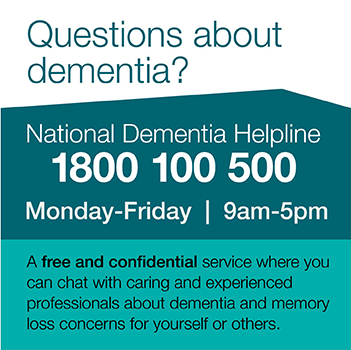 Currently there is no single test that can accurately diagnose dementia. A detailed medical history, memory and thinking tests (called neuropsychological or cognitive tests), laboratory tests and brain scans are typically used in the diagnosis process. Current research into the diagnosis of Alzheimer's disease and other types of dementia aims to develop better methods for accurate and earlier diagnosis. Early diagnosis of dementia is currently important to allow time for planning and to maximise the potential for treatment. In the future, identification of individuals in the preclinical phase of dementia, before symptoms of cognitive decline are evident, will be possible. So we will be able to predict who is going to develop dementia, rather than wait to diagnose dementia after it emerges. This could lead to lifestyle prevention strategies in order to delay dementia onset, and to earlier use of therapies that slow or halt the disease process. The search is on for "biomarkers" - biological markers which can indicate the presence of Alzheimer's disease, even before symptoms become evident. Researchers have already identified several possible biomarkers for Alzheimer's disease in the cerebrospinal fluid (CSF), the liquid which surrounds the brain and spinal cord. Levels of beta-amyloid and tau (two proteins involved in the pathology of Alzheimer’s disease) in the CSF are already being used to aid diagnosis in some parts of the world. Markers of inflammation and other brain changes associated with dementia can also be detected in the CSF and might be used alone or in combination with beta-amyloid levels to help clarify diagnosis. Obtaining CSF requires a lumbar puncture, also known as a spinal tap, which involves inserting a needle into the spinal column. While this is a safe procedure, a simple blood test would be less invasive, so researchers are also investigating similarbiomarkers of dementia in the blood. Unfortunately, to date blood biomarkers have not proven to be as stable or accurate as those measured in the CSF, but research is continuing. Neuroimaging describes a range of tools which are used to visualise the living brain, including computerised tomography (CT) scans, magnetic resonance imaging (MRI), single photon emission computerised tomography (SPECT) and positron emission tomography (PET). Researchers are working on new ways of using neuroimaging tools to diagnose Alzheimer's disease and other types of dementia. In 2004, researchers successfully viewed beta-amyloid plaque deposits in the living human brain. The study used Pittsburgh Compound-B (PiB), a substance which binds to amyloid and can be visualised with PET scanning. The results demonstrated that people with Alzheimer's disease displayed more amyloid deposits in certain brain areas compared to people without the condition. More recent research has shown that PiB-PET can also detect the early brain changes of Alzheimer's disease before symptoms become apparent. While PiB has proved quite effective, its widespread clinical use may be limited by the need for specialised equipment to produce PiB at the site of the PET scanner. Researchers are currently developing and testing other compounds that bind to beta-amyloid and may overcome the limitations of PiB. Glucose metabolism in the brain is altered in dementia and these changes can be visualised using another form of PET imaging called FDG-PET. Different patterns of reduced glucose metabolism can be suggestive of different types of dementia and so FDG-PET is sometimes used as an aid to diagnosis. Recent research also suggests that FDG-PET can detect early brain changes before the emergence of dementia symptoms and predict progression to dementia. Research is continuing to further refine this procedure for dementia diagnosis. Another type of PET scan uses compounds that bind to acetylcholine to detect brain changes due to Alzheimer’s disease. Acetylcholine is a neurotransmitter, or chemical messenger in the brain, that is involved in memory function. Detecting reduced acetylcholine activity in the memory areas of the brain may aid diagnosis of Alzheimer’s. MRI is able to image the structure of the brain, which changes in dementia, to a very high resolution. For example, a characteristic sign of Alzheimer’s disease is atrophy (shrinking) of a brain region called the hippocampus. This can easily be seen on an MRI scan and is currently used to aid diagnosis. International teams of researchers are working on standardising the scanning and analysis techniques used in MRI and establishing databases of scans of people with dementia. It is hoped this research will eventually enable an individual’s scan taken anywhere in the world to be compared with those in the database to determine whether it is normal or suggests the presence of Alzheimer’s or another type of dementia. New MRI methods are being used to image the white matter (nerve fibres) of the brain. The use of these in dementia research is in early stages, but may lead to the identification of characteristic patterns of white matter change that indicate different types of dementia and can be used in diagnosis. One large Australian research study currently using PiB-PET and MRI is the Australian Imaging, Biomarker & Lifestyle Flagship Study of Ageing (AIBL), a longitudinal study of ageing comprised of patients with Alzheimer's disease (AD), Mild Cognitive Impairment (MCI) and healthy volunteers. For more information visit the AIBL website. Memory and other thinking tests are very important tools in the diagnosis process. However, current tests can be difficult to administer and interpret, and can show bias with respect to cultural background and education level. Researchers are developing a variety of improved tests with better accuracy and specificity. For example, specialised tests are being developed and implemented to assist General Practitioners in the diagnosis process (e.g. the General Practitioner assessment of Cognition, or GPCOG), as well as tests targeted to Culturally and Linguistically Diverse (CALD) populations and Indigenous communities (e.g. the Rowland Universal Dementia Assessment Scale or RUDAS, and the Kimberley Indigenous Cognitive Assessment or KICA). Researchers are also developing batteries of neuropsychological tests sensitive to very early changes in cognitive function. As with biomarker and neuroimaging research, this aims to establish easily administered tests that can detect the presence of Alzheimer’s disease or other diseases causing dementia before symptoms of dementia are evident. The advantage of neuropsychological testing over biomarkers and imaging is that it is non-invasive and low cost. Researchers have had some success in detecting subtle cognitive decline using short batteries of computerised tests that may in future be made available online. It may turn out that a combination of biomarker, imaging and cognitive tests will be used to more accurately diagnose different types of dementia at preclinical stages, allowing early treatment and ultimately prevention of dementia when effective therapies are developed.